It is speculated that early trappers and explorers were the first to enter the Jackson area. The first white settlers in Jackson were brothers – William, George, and Charles Wood of Indiana, by way of Mankato. In July of 1856, they established a trading post and named the proposed town "Springfield" because there was a spring near where they built their cabin, a large one-room log building near the Des Moines River. Forty settlers followed in that summer of 1856. The greater number were of English and Scottish descent, from Webster City, Iowa. Over a dozen log cabins were built by that fall. The winter of 1856-1857 was one of the most severe that was ever experienced because of its bitter cold, deep snows, and violent storms. Food was scarce as all the white settlers had come too late to raise a crop or plant gardens. Consequently, all provisions had to be hauled from the nearest settlements of Webster City or Mankato. Several bands of roving Indians visited the white settlers that winter. They were always received kindly, the settlers sharing their supplies. One of these was a gang led by Inkpaduta, a lawless band, who were enemies of all Indians because of their plundering, robberies and outrages. This was the group that in March 1857, after not being extended hospitality at Smithland, Iowa, massacred 40 settlers and took four women hostage in the Okoboji and Spirit Lake area before proceeding to Springfield, Minnesota. On March 26, 1857, there were 11 able-bodied men in the Springfield settlement. Inkpaduta and his gang came down from the Heron Lake area by way of Gaboo’s camp. They first attacked the Woods’ store where, after killing William and George, they replenished their stock of ammunition and proceeded to attack the other cabins. At the Thomas cabin gathered the greater number of settlers, a determined fight was put up, and they succeeded in standing off the Indians. For the first time since leaving the Smithland area, the Indians encountered men who were not afraid to fight for their lives, and the attempt to wipe out the settlement failed. However, they did kill seven and wounded three others. Terrified of a possible second Indian attack, the beleaguered people who survived left for Fort Dodge. Just two months after the massacre and when the area was completely depopulated, the Minnesota State Legislature made this county a political division, naming it Jackson County – after the first merchant of St. Paul, MN. The temporary county seat was located at Jackson, the town site of Springfield having been renamed. Resettlement was slow, since settlers still feared the Indians. In August of 1862, the Sioux nation went on the warpath. On August 25, the Belmont community was attacked. Most of the settlers were gathered at one cabin for church. The Indians thought that they had gathered to resist their attack, so they fled before there was much of a fight. However when they first arrived, they did kill 13 and wounded three. This scared the settlers, so the pioneers took flight for Iowa. For a second time, the county seat was entirely deserted. Determined not to give up, the settlers soon returned following the Civil War in 1865 and resettled the depopulated Jackson County. They were followed by many others whose homelands were in Europe. A new era began. A stockade was built on what is presently Thomas Hill, manned by the military, which encouraged people to settle in the Jackson community. Homes were built from native timber and some from prairie sod. There were no wagon roads, no bridges, no churches, and only one school that served the community. Despite the terrors of living in a country exposed to Indian attack, numerous disasters, prairie fires, severe blizzards, crop failures, and the grasshopper devastation of 1873, these hardy, courageous pioneers survived and gave us a heritage we can be proud of. From the birth of Springfield Addition in July, 1856, the pains and suffering of a strong settlement have established a prosperous farm and industrial community known as Jackson. Jackson County Courthouse is also on the National Register of Historic Buildings. It was constructed in 1908 by Charles Skooglun of St. Paul according to designs by Minneapolis architects Buechner and Orth. Beautiful murals adorn the Court Room and Rotunda, and have recently been refurbished. The murals are noteworthy for a subliminal humor in the execution of various figures and subjects. Several of the figures have either four or six toes! The lower level is host to personal collections, on loan and displayed for many visitors to enjoy. Open to the public, hours are 8:00 am to 4:30 pm, Monday through Friday, closed weekends and holidays. Ashley Park Monument contains the history of the Indian Massacre and is located along the beautiful Des Moines River. Also in Ashley Park, is the Olson-Slaabakken cabin, Jackson County's oldest structure. The cabin was donated by Emmet Olson in 1927 to the Park. A Historical Marker is located on Springfield Parkway, just NW of the elementary school, marking the spot where the Woods Brothers had their trading post. Fort Belmont hosts several items of interest including a sod house,1873 farmhouse, blacksmith shop, log cabin and stockade, 1902 Delafield Lutheran Church, a gift shop and museum. A tour of the Fort is something you won’t want to miss. The church is home to weddings as well as WWW (Worship, Word and Watermelon) services each Sunday at 7:00 p.m. June thru August. A Rendezvous is held annually at the Fort the weekend after Labor Day. The site is located just south of I-90 and US Hwy 71 turn right onto Belmont Lane. Call 507-847-3867 for additional details or to book a tour. Historic State Theatre— Runs movies every evening. Matinees are also available on weekends and during school breaks. The interior reflects a unique Art-Deco style and includes 600 seats in the auditorium and balcony. The focal point of the theatre is the huge ‘silver screen," one of the few in the area. Viewing a movie on this screen is something you don't want to miss. 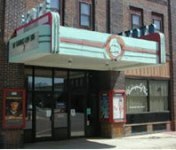 For current movie information call 507-847-4360 or click their name above to go directly to their web site. Jackson County Fair Village consists of 20 historical buildings and is located at the Jackson County Fairgrounds. A home, church and various business buildings, complete with furnishings, depict what "Main Street" might have looked like in a former era. Antique machinery and other items of interest are also on display. The Fair Village is open to the public during the Jackson County Fair, held the last week of July through the first Sunday of August. Tours are available by appointment the rest of year. Contact the Jackson Area Chamber of Commerce for additional details. The Jackson County Historical Society and Museum, located about 10 minutes west of Jackson at Lakefield, Minnesota, provides a look back at our County’s history. Other unique attractions at the museum include the Jackson County War Memorial and Historical Mural. Exhibits and a research library are open all year, Monday through Friday, 10:00 am to 4:00 pm. Call 507-662-5505 for additional information.